And contact us for further information. The morning workshops are taught by Susan Tiberghien or by guest instructors. 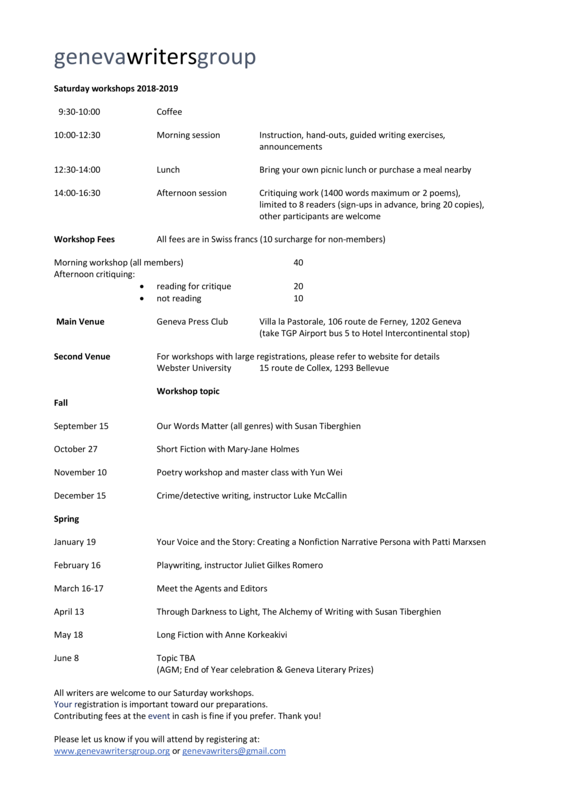 The workshops deal with the art and craft of the proposed subject (personal essay, flash fiction, dialogue, etc. ), with handouts and guided writing exercises. The participants leave with written work that they may continue afterwards. The afternoon workshops when led by Susan Tiberghien are critiquing workshops, with a limited number of readers and an open number of participants. The readers distribute copies of their work (limited to 1,500 words), then read and listen to the critiques. When led by guest instructors, the workshops build on the morning subject and work. The saturday workshops are open to all. However we ask for registrations in order to set up the room, make copies of handouts, etc. When there are master classes on Sunday, the number of participants is strictly limited. Registrations are on a first come basis. Q: How interactive are the workshops ? Should I bring anything with me ? A: There are always exercises given, sometimes in partners. It’s handy to bring paper, pen, and something to write on. Although some members rely mainly on electronic devices for the writing exercises. Q: If I wish to participate in a Master Class, what is required of me ? A: Having a strong background in the area of focus helps. Participants read the work of all other participants in advance and make written comments on the work of all the other writers. Only one Master Class per year is generally allowed per GWG member, though a writer can join in a second MC if room is available.